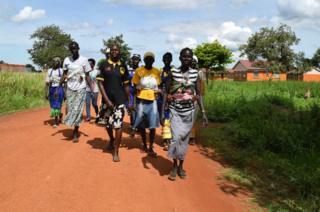 An estimated 86% of the more than 900,000 South Sudanese refugees in Uganda are women and children, says the UN. Massive numbers have streamed in since the brutal civil war at home reignited last July. The flight from violence and chaos, often without time to plan, has left many families separated. Mothers and children run alone. Husbands and fathers are either staying behind to work, fighting, missing or presumed dead. 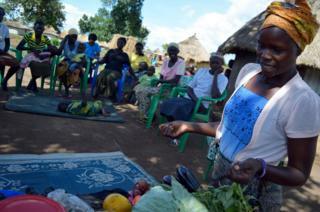 As a result, many women are leading their extended households and communities in Uganda's refugee settlements. With the support of each other, the authorities and international non-governmental organisations (NGOs), they are trying to build a life. They didn't plan it, but they now find themselves living in a woman's world. In many refugee settlements, women are working together to pool their skills and resources. Members of one of 120 mother-to-mother support groups set up by charity Action Against Hunger near Adjumani, northern Uganda, have established a new kitchen garden outside the settlement of Mungula. In each group, the NGO trains an elected lead mother to teach the others about nutrition, infant feeding, hygiene and staying healthy. Agnes Namadi, 29, explains she has learned about the importance of avoiding illness and malnutrition, and adds: "When you eat cassava it gives you energy and these greens and mangos can give you vitamins." Many groups also take on income-generating projects like making soap, keeping poultry or growing extra vegetables, which gives them cash and a communal savings pot from which they can borrow at low interest. They also support each other emotionally and practically. Some of the women in Mungula are longer-term refugees who have married since arriving, while others are alone. Refugees are given basic food rations, which have been halved for all but the most vulnerable, malnourished or newly arrived, because of the new influx since 2016. One staple meal is porridge, to which the mothers add items like ground silver fish, peanut paste or milk added for extra nutrition. "It's important for women to stay together and interact and share ideas," says Agnes. "Women are very strong. Those without husbands might feel isolated, but in the mothers' group they have their sisters." Group member Keji Roda, 29, fled South Sudan without her husband in 2014. 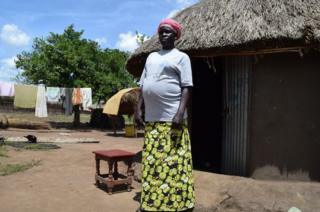 She visited him near the Ugandan border last year and now she's expecting their fifth child. She's also caring for her widowed sister's three children. "What forced me to come was the killings. People were picked from their homes and shot." When she arrived she had to master constructing their house: "I laid the bricks and cut the grass, then sold some food rations to pay men to help." She says her husband is afraid to leave South Sudan. "Most of the husbands who come here are accused by our government of being rebels. Once you disappear there's no going back. I don't know when I'll see him again. Now I just hear the voice through the phone." The Mungula group has started making liquid soap to sell. Action Against Hunger provided the initial start-up materials and is helping them get going with a loans system that will grow their profits before they're redistributed. They make 20 litres of soap at a time, pour it into used water bottles and each sell their own share at 1,000 Ugandan shillings (22p; 28 US cents) per 500ml. So far they've saved 600,000 shillings (£130; $165). 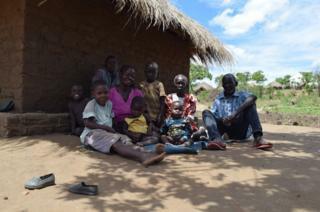 Half and hour from Adjumani, in Boroli settlement, Josephine Eiyo (pictured right), lives alone for much of the time. 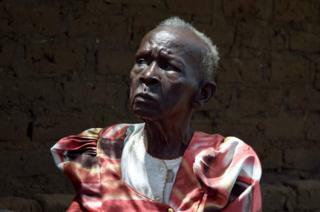 Her son and daughter live with their grandmother in Adjumani, where they go to school, and her husband is missing in South Sudan. Having arrived in 2014, she supports the community by working in a village health team, receiving patients at her home and doing house calls, which takes some pressure off the health centre. 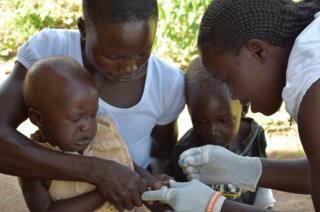 A mother has come with a sick child and Josephine does an instant blood test for malaria which comes up negative. "We women have different ways of supporting each other. We can mobilise ourselves and dig a small parcel of land, then next day we do it for someone else. We also help by visiting each other. Whether old or young, we live jointly." 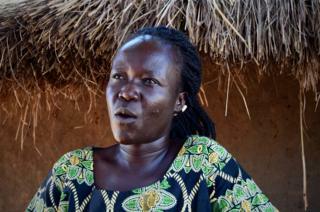 "We ran from our village when fighting began at midnight and people were asleep," says Josephine. My husband had gone away to Malakal, to work. There was no communication between us. I haven't seen him since 2013 - I am thinking that he has died. I've been trying to find him via the Red Cross but they can't get through to him." Josephine, 30, is paid a flat monthly rate of 34,000 shillings (£7.45) for her health work. 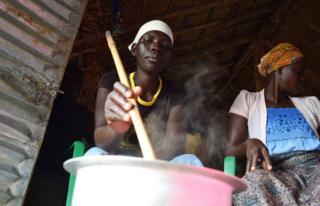 To get extra money she also brews alcohol and cooks bread, but it's still difficult to cover food and school fees. "Sometimes we eat rats. You can buy five for 1,000 shillings (22p) then you have something good, and tasty, for your diet. Meat costs 10,000 shillings (£2.20) per kilo, but rats have the same food value so there's no need to struggle to buy other meat." 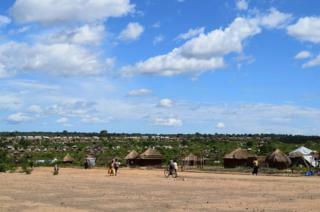 A four-hour drive west of Adjumani, across the River Nile, is Bidi Bidi. It's now the largest refugee settlement in the world, housing more than 270,000 people since the recent influx which at times neared 3,000 arrivals per day. Uganda's progressive refugee policy means they're all accepted, given a plot of land for a house and garden, and are free to work and travel. In return, the host community benefits with jobs, infrastructure and access to services, although the system is under immense strain. When Action Against Hunger arrived last August, Bidi Bidi was a sea of white plastic UN tents, but refugees are gradually creating homes. Programme manager Joel Komakech says now the emergency is subsiding, refugees are taking leadership roles "to help rebuild their lives". "Undeniably, we see the women taking centre stage in that." Mother-of-four Rejoice Sunday, 38, arrived in Uganda in September and is already working in Bidi Bidi as a hygiene promoter. She goes house to house checking for latrines, dish-drying racks and washing facilities, and giving breastfeeding advice. Her husband is working in northern South Sudan as a driver. 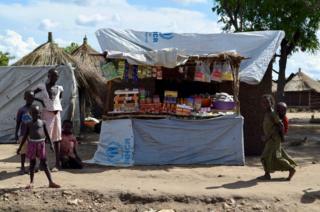 He was away when she fled the fighting in Yei, with her in-laws and four children. They met two lone teenagers en route and have brought them into the family, which she heads. "We are nine now," she says. "As we fled, the soldiers tried to follow us, then the rebels killed one of them - we heard gunshot behind us but just kept going. We thought we wouldn't reach the border... those people have no mercy." Her husband has visited them once to bring money but it's far and expensive. "Coming here without him has been difficult. I haven't experienced this before." Veronica Yabang, 45, is also responsible for eight other people in her household - her two-year-old twin sons and their older brother, three nephews, her elderly brother and very elderly mother. She doesn't know where her husband is and says "there's no hope of him coming - he has no idea we're here". By the time they were brought to Bidi Bidi, twins Dickson and Daniel were suffering from malnutrition. "They were well nourished at home but when we came here there was a great change in their diet. I saw the signs - their hair was going brown and their eyelashes were lighter. 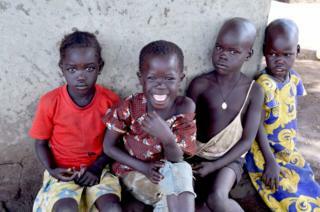 They were admitted to the malnutrition programme and had weekly feeding. Their bones were exposed and I was afraid I could lose a child at any time, but they're doing fine now." As Veronica's mum Christine Kakune has a 77-year-old son, she's estimated to be aged between 90 and 100, but she doesn't know for sure. She also had to be treated for malnutrition after a difficult start in Uganda without enough food. Caring for everyone sometimes takes its toll, says Veronica. "There are times when I don't sleep at night. I am worried about handling all the responsibilities - providing things, taking care of the children and also my mum." Earlier this month the UN said more than one million children have now fled South Sudan, which has the world's fastest growing refugee crisis. "Women and children bear the brunt of this senseless war," UNHCR's Uganda representative, Bornwell Katande, said recently. With "chronic underfunding" tipping the relief effort towards breaking point, a UN summit in Kampala in June will attempt to raise $2bn (£1.6bn). With no end to the South Sudan conflict in sight, the refugee situation is unlikely to change soon, but the Ugandan government has vowed to maintain its open-door policy. Action Against Hunger nutrition officer, Dorothy Namayanja, who works with refugee families every day, says perhaps one could argue the situation is unsustainable. "But we don't have any choice. They are our neighbours - tomorrow it could be us, God forbid." All photographs and interviews by Paula Dear. Video Why is peace in South Sudan so elusive?